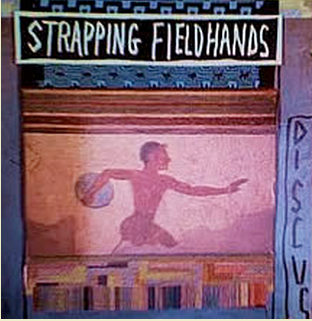 Philadelphia’s Strapping Fieldhands are one of the most difficult bands to categorize. In fact, they created their own genre. Lead singer and songwriter Bob Malloy is America’s foremost poet laureate. The Strapping Fieldhands sound like a cross between Ralph Peer 1920’s-era field recordings done on a portable disc-cutting machine and the stunning simplicity of Guided by Voices stripped down indie rock. They combine the best of the old & the new. 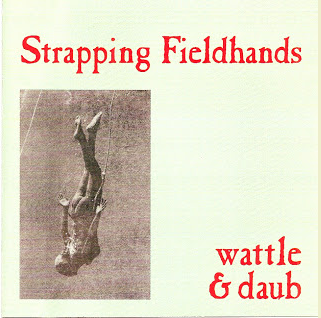 Shangri-la Projects is lucky enough to work with Strapping Fieldhands on two of the greatest album releases of the 1990s: 1994’s Wattle & Daub & the cd issue of Discus, one of the most enigmatic releases of the ‘90s. Both records are essential for music fans of all ages and sizes. While Discus is long out of print on vinyl, Wattle & Daub is still available on both lp & cd for the psychedelic record collector. Strapping Fieldhands - Wattle & Daub L.P.
Wattle & Daub full-length lp. 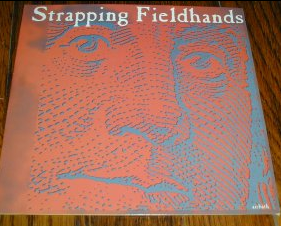 Hailing from Philadelphia, Pennsylvania,the Strapping Fieldhands have to be one of the finest, most enigmatic American bands to arrive on the continent since Syd Barrett & company moved to Athens in the early '80s. The easy-on-the-ear pop hits "Ben Franklin Airbath", "the Oath," & "the Author in Her Ear" put the Fieldhands in a league of their own as far as contemporary British-American minstrels. Their Shangri-la Projects full length release Wattle & Daub is a psychedelic masterpiece which blows minds every time a needle hits the vinyl. Invest now before the psychedelic collector goobs figure out this lp is still less than $400. Same as above, but in CD format. Discus, one of the defining records of the incredible U.S. indie rock world of the early 1990s, has never been available digitally until the fall of 2009. Philadelphia's Strapping Fieldhands released this vinyl-only masterpiece in 1994 to rave reviews. Spin Magazine called it one of the "Ten best records of 1994 that you have never heard." Discus is absolutely mind-blowing, genre-busting, timeless leftfield pop that has never been heard as deliciously as it plays now in its remastered digital format. Included are liner notes by Andrew S. Earles. Run--don't walk--to your computer to order this masterpiece. Strapping Fieldhands - "Ben Franklin Airbath"/ Simple Ones "Forget You"
The easy-on-the-ear pop hit "Ben Franklin Airbath" was commissioned by an overly enthusiastic Robert Pollard on his first visit to Philadelphia. Backed with a monster pop smash track by the Simple Ones, this is an essential Shangri-la Projects masterpiece. This video contains some hilarious interview and great live footage ofthe Strapping Fieldhands at the Antenna Club in Memphis circa 1995. Interview conducted by Shelby Bryant of the Clears and“Hippie” Dave Dunlap with a special guest cameo by other music industry figures.